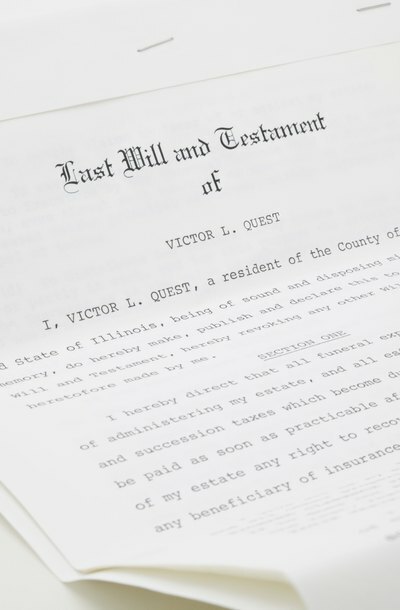 The proliferation of online will preparation services has helped more people create wills at substantially lower costs than they would otherwise pay. In many cases, online wills provide excellent protection at a substantial value. However, highly complex wills may require an attorney, and no document preparation service can completely replace lawyers. People who prepare wills online should make sure they fully understand the questions asked by the will preparation service, and should check the final product to ensure it says what is intended. The cost of an attorney is one of the most common reasons people turn to online will preparation services. Lawyers are prohibitively expensive for many people, and frequently charge just for the time required to gather all of your information. For people on a tight budget, online will preparation can provide asset protection and some security. Due to changing estate tax laws, however, people with large estates should consult an attorney before writing their will. An attorney can advise you about the division of your property and tax liabilities your heirs may face. Online will preparation is extraordinarily convenient. It saves you the trouble of finding a lawyer, scheduling an appointment and spending your time discussing your assets with her. For people looking to save time in writing a will, an online document preparation service is absolutely the way to go. However, it's important to ensure you use a reliable document service, so read reviews and ask for referrals, just as you would do if you were hiring an attorney. If a will preparation service makes an error in your will, the time spent straightening it out can greatly exceed the time you would have spent meeting with an attorney. Document preparation services pride themselves on explaining the basics of wills to people who have no familiarity with the law. Typically, you must answer a few questions about your assets that prompt more questions if necessary. Most services provide further information regarding the questions asked if you request it. Some people, however, get overwhelmed by the sheer volume of information they must provide and begin to second-guess themselves. These people may feel more comfortable having an attorney talk them through each step of the process. An online document preparation service is not a computerized lawyer, although some services do offer phone support and most have attorneys on staff to check documents. Thus if you give incorrect information to the document service — even if it's because you didn't understand the question — your will may not be enforceable, or may not say what you want it to. Attorneys, however, tend to double-check work and ensure they get correct answers from their clients — something an automated program can't do. Additionally, state laws can change rapidly and attorneys are generally aware of changes. Online programs, however, have to be continuously updated, leaving a small chance that the will you've designed doesn't match the current laws in your state. A living trust transfers control of your property to a trust while you are alive. You may serve as trustee; a successor takes over after you die. A will takes effect after you die; an executor administers the distribution of your estate. Many people consider do-it-yourself forms or online software programs to draft their own living trusts and last wills. It may be possible to construct a valid document that distributes your estate according to your wishes. However, experts generally agree that beyond the most uncomplicated circumstances, saving money with a do-it-yourself-will or trust may produce unintended, detrimental consequences. Do-it-yourself divorce kits abound on the Internet, but if you’re divorcing an abusive spouse, representing yourself might not be your best option. If your spouse hires an attorney, you’ll be at a disadvantage if you don’t have a good working knowledge of court procedures and the laws in your state. If you have children, you might risk losing custody if your spouse plays dirty. If you need spousal support for a while, until you can get on your feet, an attorney can usually get that for you. Most states offer low-cost or even free options for representation.